For fast and accurate checkout please have your card or a digital representation of it with you. MPLS is a part of WV’s Northern Library Information Network. To obtain a free MPLS card please present your application and proof of identity and current WV mailing address. If your valid driver’s license or other photo ID has your current mailing address, that’s all you need. If your address is different from your identification please bring an addition item such as car registration, checkbook, or piece of mail from the last 30 days. Digital documents will also be accepted. Books – may be checked out for 3 weeks and renewed for an additional 3 weeks unless another patron has placed them on hold. DVDs – up to 4 may be borrowed for 4 days, They cannot be renewed. Music & Audio Books – Up to 10 music or audio books may be borrowed for 3 weeks. Certain test preparation materials require a cash or check deposit to checkout, a full refund is made when the items are returned. Life happens, and we’re all in this together. Please return your books by the due date. Two overdue notices will be sent out before you receive a bill for the items. Your account will be suspended (including access to digital materials) until the overdue items are returned. Patrons will be charged the replacement cost for any lost or damaged items. Placing holds on currently checked out items is a great way to get the books you want to read ASAP. 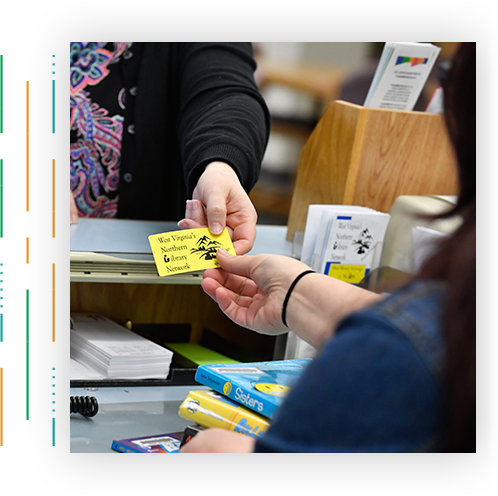 Holds can be placed at the circulation desk or by visiting the My Library portal of our online catalog. Can’t find what you’re looking for? We can borrow it from another library, just ask! or use the My Library portal of our online catalog. Books, audio books and music can be renewed for an additional 3 weeks if there are no holds on the materials. You can renew items your self by visiting the My Library portal of our online catalog.